ESXi Installation on NUC6i7KYK fails with "Fatal error: 10 (Out of resources)"
This problem is caused by the Thunderbolt Controller, which is a new component in the NUC6i7KYK, and therefore only the Skull Canyon NUC is affected. The problem can be solved by temporarily disabling the Thunderbolt controller during installation. If you need additional Network Adapters, the best solution is to use an USB 3.0 NIC with the vghetto-ax88179 driver by William Lam. We had a nice email discussion in the last week regarding the error, brought together by Raymond Huh. Together with VMware employee William Lam (virtuallyGhetto) and an engineer in the background, Paul Braren (TinkerTry) and Olli Salonen (The NUC Blog). 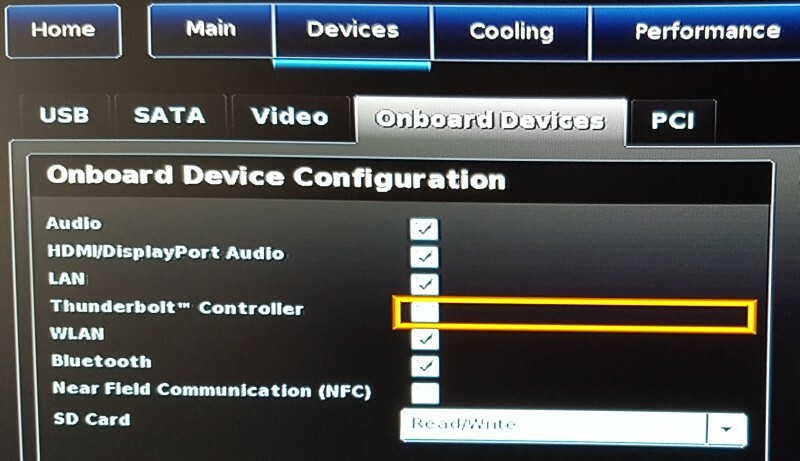 William Lam has also written about the solution with some further recommended BIOS Settings: ESXi on the new Intel NUC Skull Canyon. Very nice to see that we have smart guys that can get unsupported non-enterprise stuff to work on weekends. I just tried to install ESXi 6.0 U2 on my new Skull Canyon NUC and ran into the same exact issue. This is a BUMMER. I was hoping to use the Thunderbolt controller for connecting a secondary NIC (Apple Thunderbolt-to-GigabitEthernet adapter) using either about-to-be-released Kanex Thunderbolt3-to-Thunderbolt Adapter or Startech Thunderbolt3-to-Thunderbolt adapter. I see that you re-enabled Thunderbolt 3 in BIOS after you installed ESXi. I will try that as well. When I disabled Thunderbolt 3, ESXi 6.0 U2 installed fine on the Skull Canyon NUC. Another caveat: I didn't install any SSDs in the Skull Canyon NUC because I am using iSCSI SAN for all of my datastores. I installed ESXi 6.0 U2 on a 8 GB USB3 flash drive. However, once the ESXi installer completed, and the NUC Skull Canyon rebooted, it could not find any media. It turned out that for some reason, I need to enable UEFI boot, after which ESXi 6.0 U2 booted off the USB flash drive. I tried again to disable UEFI in BIOS, and the bootable media could not be found again. I'm not sure why this is the case, and why the legacy boot is not working with ESXi 6.0 U2. The BIOS I'm running on the Skull Canyon NUC Is KY0034, to which I upgraded from 0033. I had the exact same problem. Solution worked like a charm. Thank for the solution. I have just installed ESXi 6 U2 on a Skull Canyon but don't seem to be able to see my two NVMe drives? The only thing I can think that is different to other setups, is that I have used Samsung PM951 drives instead of SM951s? Does anyone have GPU pass through working with ESXi and this NUC yet? Thanks so much for the pro tip! Finally moving forward with my Intel NUC build thanks to this. I've hit the same problem but with A gigabyte brix (GB-BSiHT 6200). btw, I'm running an old f/w version (F1). Would it help to flash to latest? I think F3 has the thunderbolt config, for example. Has anyone out there had experience of this issue on Brix 6200 unit? Any ideas, folks? Is it time to try Hyper-V? I had the same problem with ESXi 6 install on a Gigabyte Brix i5HT-6200, which was solved by a firmware upgrade (from F1 to F5). Unfortunately, now getting 'Chipset initialization failed.' when the ESXi tries to run. seems to happens at VMKApci load. Dont suppose anyone can offer any suggestions. Really dont want to resort to Hyper-V.
Has anyone had any experience of ESXi 6 on any of the Intel 6th Gen Brix unit?